How to Convert Audible AAX to MP3? Audible is now the world’s biggest downloadable audiobook producer. You can download all kinds of audiobooks from Audible.com but you might not be able to listen to them freely as you want as it’s got DRM protections on their audiobooks that prevent you from listening to them with unauthorized audio players or on unauthorized mobile handsets. Audible has developed apps for different devices of different platforms. On computer, you can use Audible’s own program to listen to and download audiobooks, you can also use iTunes to listen to the purchased AAX audiobooks. Also, Audible has developed its own apps for Android and iOS, if you use one of those phones, you may download the Audible app on them. But in this case, for mobile devices that are not supported by Audible, the only way is to convert AAX to MP3. That way you would be able to transfer them to your MP3 player for playback with no limitations. So in this post I will show you how to convert AAX to MP3 for free playback on MP3 players. As is mentioned above, AAX audiobooks have DRM protections applied on them which stops you from playing them on unauthorized devices. So you are going to need an AAX converter that’s powerful enough to remove the DRM protection from them. Here’s one AAX converter that you can use to do that: Leawo TunesCopy Ultimate. 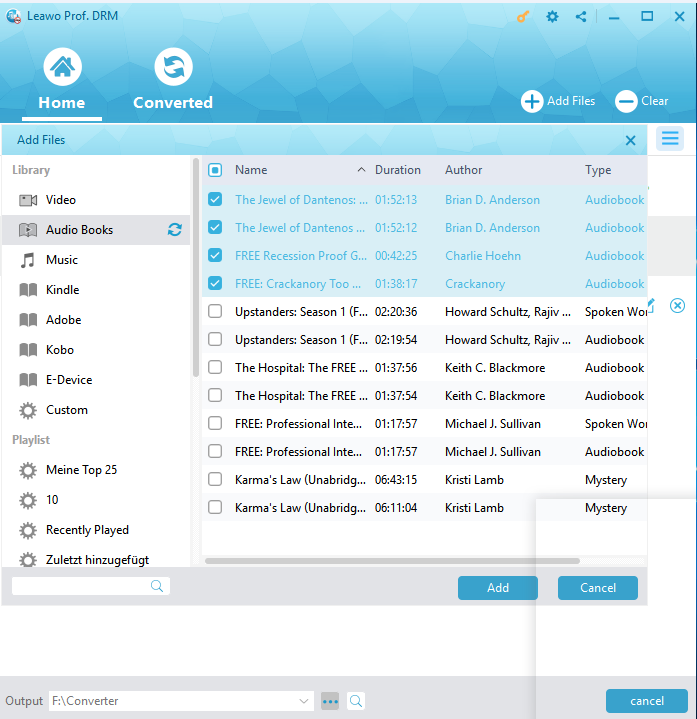 It’s a powerful Audible audiobook and iTunes media converter that can remove DRM from Audible audiobooks and iTunes media content and convert them to files in common formats. With it you can convert AAX file to MP3 and play them on your Sony MP3. Here’s how to use Leawo TunesCopy Ultimate as an AAX converter to convert Audible AAX to MP3. The program is fairly easily to use, just follow the instructions below and you would be able to easily convert AAX file to MP3 with no problem. Step 1. Add your AAX audiobooks to the program. Launch Leawo TunesCopy on your computer. 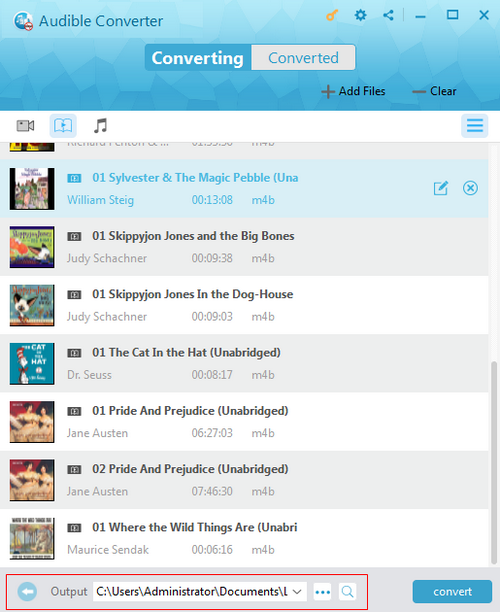 On the interface of the program, there are two Add Files buttons, click on one of them to select the Audible AAX audiobooks and import them to the program. You can also directly drag and drop your Audible AAX audiobooks to the interface of the program to add them to the program. Note: When you import the AAX audiobook to TunesCopy, a popup might show up and request the authorization from Audible. To authorize the import process, just sign into Audible with your Amazon account and the authorization will be done. Step 2. Adjust the audio parameters of your AAX audiobooks. The audio parameters of the audiobooks are available for changes. If you need, you can change them. To do so, just select one audiobook on the file list, and then click the Edit button to the right of the audiobook title. You can change audio parameters including Bitrate, Sampling rate and Channels. Step 3. Set default output path. The default output path can be found in the bottom left-hand corner of the interface. It’s where the converted AAX audiobooks are going to be saved in. To change the default output directory, click on the “…” button right next to the output directory box. If you are happy about all the settings, you may start the AAX to MP3 conversion. The Convert button is located in the bottom right area of the interface. Click on it and the AAX to MP3 conversion will start immediately. The progress of the conversion will be shown on the interface. Your Audible AAX audiobooks will be converted to MP3 by default. When the program is done converting AAX file to MP3, you can transfer them to your MP3 Player for unlimited playback. Leawo TunesCopy Ultimate is a powerful DRM removal program, with it you can not only convert Audible AAX file to MP3, you can also remove DRM from iTunes music, videos and audiobooks and convert them to common media file for unlimited playback on mobile devices.